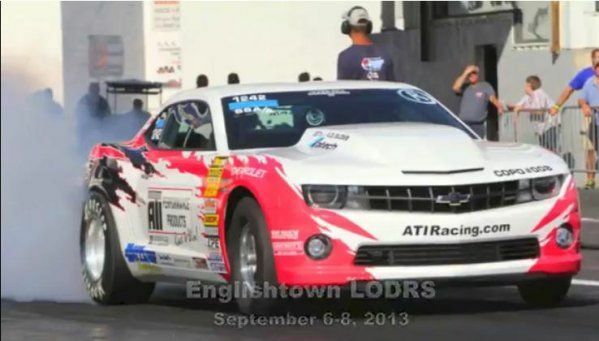 ATI had been running their Chevrolet COPO Camaro #008 this summer in hot climates with solid results but as the team took the Camaro to Englishtown on September 8th with temperatures dropping below 75 degrees for the first time this season – the ATI COPO Camaro really put down some crazy numbers. On the best run of the weekend – which you can watch from a variety of angles in the video below – the ATI COPO Camaro was able to blast through the quarter mile in just 8.449 seconds with a trap speed of 161.83 miles per hour. That is the quickest run by a modern COPO Camaro in class racing and in the NHRA Super Stock A/Automatic (SS/AA) class, this is the new official record. While the NHRA Super Stock classes require that the vehicles are all setup to stock specifications under the hood, this record setting Chevrolet COPO Camaro is fitted with a variety of ATI Performance Products that helped bring about this record run. The ATI COPO Camaro was equipped with ATI’s Fuel Comp T400 transmission in an ATI SuperCase while a 9 inch Fuel and Blown Torque Converter. ATI has also added an LS1 crank adapter and flex plate with a 10 rib ATI Super Damper to help spin the supercharger. Detroit area based Katech (the people who build the motors for the Corvette C6R race program) built the motor for the ATI COPO Camaro entirely with factory issued General Motors parts to original factory specs while a Whipple 4.0L blower helps to make enough power to rocket this beast into the mid 8 second range. The most exciting part of this news is that with temperatures dropping and a couple months left in the 2013 drag racing season, the ATI team has plenty of time to get their Chevrolet COPO Camaro back to the track to back up that record run. As temperatures continue to drop and the air gets better, there is a good chance that we could see more NHRA Super Stock records from the ATI sponsored COPO Camaro. Of course, there are dozens of other COPO Camaros racing around the country with the top of the line Whipple 4.0L setup that could also take a shot at that NHRA SS/AA record before the season comes to an end. However, until someone turns in a better time than 8.449 at 161.83 miles per hour – ATI gets to brag about owning and building the fastest Super Stock A/A car in the modern racing world. In addition to the record setting run, the video below shows the ATI Chevrolet COPO Camaro racing throughout the weekend on which that record run was made and while none of those other runs were as quick as the 8.449 run – they were all impressive and they all sounded great. Crank up your speakers and enjoy!